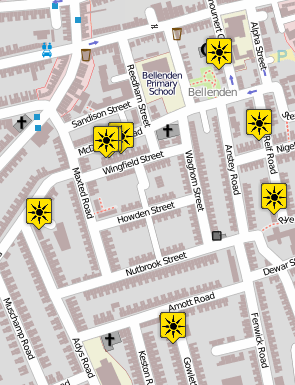 My latest experimentation in environmental maps has been launched on the Peckham Power web site. It grabs the set of energy generators in London (updated every hour from OpenStreetMap) and plots low/zero carbon generators on the map with icons and information to tell you what sort of technology each one uses. The idea is to, eventually, impress people who didn’t realise just how much of this exists in London already. In developing the code that creates the clickable points, I realised that the OpenStreetMap tagging schema doesn’t cope with the many different types of technologies very well. So I am currently taking a detailed proposal through the wiki process to rationalise and expand the “power=generator” feature – comments welcome! It will go to a vote in a couple of weeks. As Oliver Kühn has pointed out, data contributors aren’t always aware of the needs of data consumers. The very sparse coverage of energy generators in OpenStreetMap is a case in point; the cluster pictured in this post was a result of a little stroll I took with a friend and Peckham Power founder Anna Plodowski. But across London there are only a few generators visible, out of hundreds or thousands that must exist. I hope this map might spur others to contribute more data. I am also talking with contacts in the Greater London Authority and Southwark Council about getting data they hold into the public domain, to be imported into OpenStreetMap. Public bodies, and organisations like housing associations, must hold lots of data on their own kit without complex data protection issues that would stop installation companies contributing their data. In time, it might become an interesting point of collaboration with government and third sector groups, as currently nobody holds any data indicating the extent of low and zero carbon energy generators in London! Next Post Are minor points of interest poisonous? No reason why not, I’ll give it a go when I redo the tagging code in a couple of weeks after the proposal (hopefully) goes through. My only worry would be performance once it scales up. The OpenLayers code I used isn’t very good with large data sets. I think you could also add extra layers to the XAPI one, so you could, for example, also provide some other kind of data without messing with the osm db. Some generic OpenLayers code to provide points for any kind of query would be great. I did talk to the author of NOVAM about this earlier in the year, but he was too busy. One for the future, if anyone fancies giving it a shot.